On this page, you will learn to build a RESTful web service using Spring Boot. Spring Boot makes the task easier to build a REST web service. You don’t need to do lots of configuration and that’s the power of Spring Boot. In short, you will do zero configuration. and it will produce the data in JSON format. 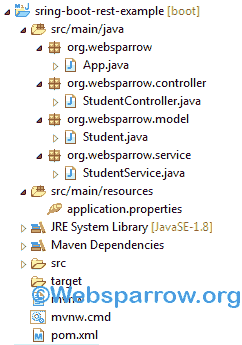 Building a RESTful web service in Spring Boot, you need the following dependencies. Add the following code in your pom.xml. Create a Student model class along with its attributes and a parameterized constructor will all attributes. StudentService class provides the services to the controller based on the request either you want all student data or one and @Service annotation indicates that an annotated class is a “Service”. In Spring’s approach to building RESTful web services, HTTP requests are handled by a controller. These components are easily identified by the @RestController annotation, and the StudentController below handles GET requests. Create an App class and execute it. Note: If the embedded Tomcat was unable to start, add the below code in your application.properties file to change the Tomcat server port.